The Adidas AdiZero Tour is one of the lightest golf shoes in the market as they bring all their experience from the world of football to golf. It undeniably looks like a football boot in some ways but we don't think that is a bad thing as the styling gives it some very elegant lines. 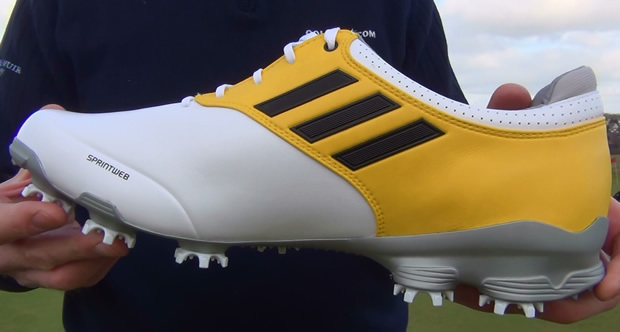 The white and yellow version is a bit marmite, but the all black and all white versions look much more classy than some of the recent tour shoes, especially the black one. The weight of the shoe is the first thing you notice. At 310 grams is it 40% lighter than the Tour 360 ATV and this has to be felt to be believed. Having worn them for several rounds you hardly feel you are wearing anything on your feet compared to most other shoes and this must surely have a benefit over a long round as you will be less fatigued. The Sprint Frame outsole is exceptionally thin but despite this the comfort is excellent. The raised spike ports did make us wonder if they would still be comfortable on firmer ground, but having played with them on a links course, we were very impressed at how the sole moulded to ground. The spikes seemed to offer a lot of cushioning and on a parkland course these will feel like slippers. The upper is a Sprint Skin microfibre leather than is one piece and is very soft. We have only used them for a few rounds, but it looks like the will be easy to maintain longer term as cleaning them was just like wiping a cloth over a more man made fabric. The fabric broke in very easily and quickly and should maintain its appearance over time, but if it doesn't we will report back on that. Adidas say that the shoe is waterproof and having played through a monsoon recently with them, all for your benefit dear golfers, we can confirm that they do keep your feet dry. It was a cold Scottish March monsoon so whilst the waterpoofing was very impressive the thin upper was not quiet as warm as other shoes, so it should be ideal for the summer. Most lightweight shoes can suffer from a lack of stability, but the Adidas AdiZero has a very rigid frame that resists foot twisting and the upper is resilient enough to support your foot throughout the swing. The shoe is a little narrower overall than your average adidas shoe, which were already on the narrow side. Adidas say that the AdiZero is wider in the mid section than any of their other golf shoes and we found that the fit was OK. On a general point we had to go down half a size on our usual Adidas shoe size with the Adizero so try before you buy. There will no doubt be more lightweight shoes coming out, but the Adizero has set the bar very high in terms of weight and performance combined with stability and we would happily recommend it. I purchased the Adizero golf shoe in the late summer of 2015 and used them several times and found them very comfortable and it was easy to walk 18 holes with them. I bought them because the supposedly waterproof Adidas shoes I had before proved to be useless in wet conditions. The first time it rained while I was golfing in 2016 your "water proof" Adizero shoes did not keep my feet dry at all. I put the shoes in the back of my van and by the time I got home my wife could not stand the smell coming from the shoes. I put the shoes in the sun to really dry them out and then sprinkled baking soda into them. At that time both the insoles and the shoes stunk-I could not tell which was worse. So, after about 10 uses, I have not worn them since. After spending the winter in the garage, the shoes have only a slight smell to them. Maybe I'll try again??! !